Not a whiskey fan? Think again! This refreshing, 3-ingredient Ginger Whiskey Cocktail recipe might just change your mind. I’m a total whiskey fan. 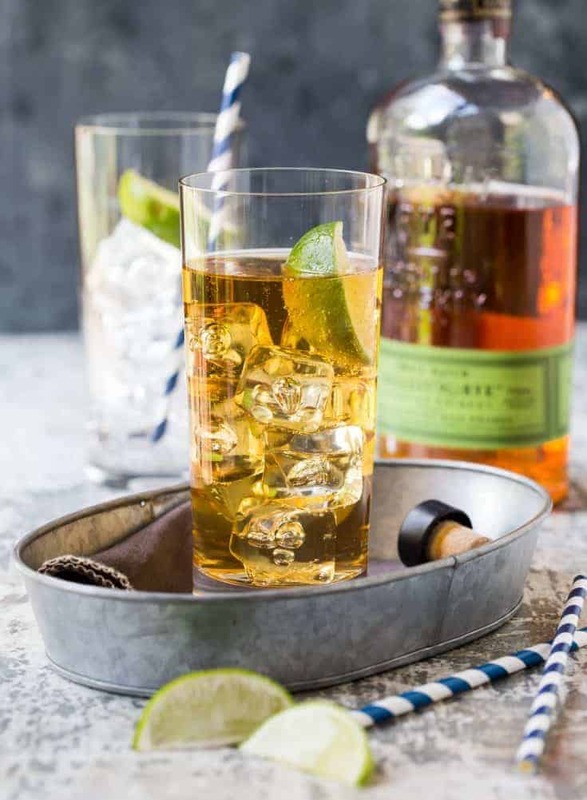 Some of my favorite whiskey cocktails are these Bourbon Apple Cider Cocktails, a classic Old Fashioned made with maple syrup and this Gold Rush Cocktail made with bourbon and Domaine de Canton ginger liqueur. But when I’m craving a super fast whiskey libation, nothing beats a long, tall glass of this refreshing Ginger Whiskey Cocktail. What ingredients do I need for this Ginger Whiskey Cocktail? Whether you call it a ginger whiskey or a whiskey ginger, this cocktail couldn’t be simpler to throw together after a long day. You only need three ingredients, so grab your ginger ale, whiskey and some fresh lime wedges, and you’re ready for happy hour. The only time I’m a stickler for a certain type of whiskey is when St. Patrick’s Day rolls around. Since everyone is a little bit Irish on March 17th, Irish whiskey is a must in this Ginger Whiskey Cocktail on St. Paddy’s Day. I’m not a huge whiskey fan. Will I like this Ginger Whiskey Cocktail? Not feeling the whiskey love? I know whiskey can be a bit polarizing. Either you love it or can’t stomach it. I like to think this Ginger Whiskey Cocktail is a happy medium for those non-whiskey lovers out there. The bubbly ginger ale mellows the whiskey and keeps the cocktail’s flavor light and bright. Stir in a squeeze of fresh lime juice, and your happy hour cocktail is good to go. Tip: Only have bourbon on hand in your liquor cabinet? Feel free to use either bourbon or whiskey here as both work equally well. This Ginger Whiskey Cocktail can also be the star of a DIY drink station. 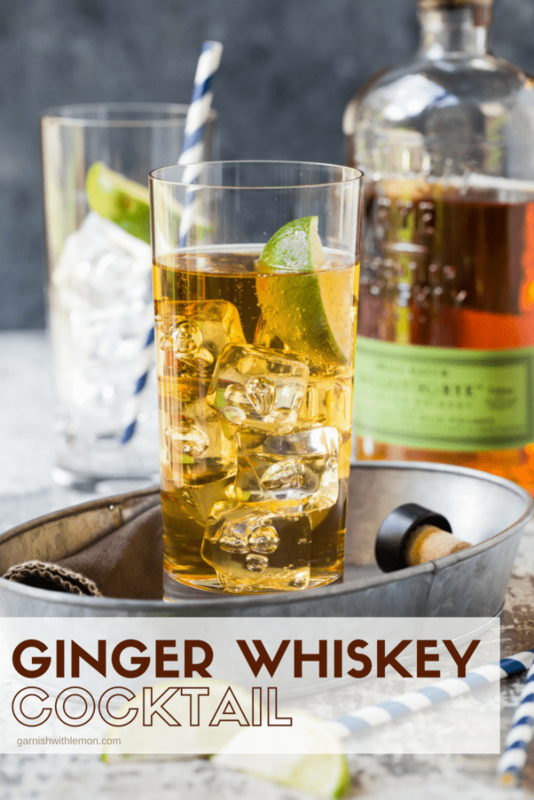 Make this Ginger Whiskey Cocktail the signature drink for your next party! Simply create a DIY cocktail space so guests can mix up their own beverages. 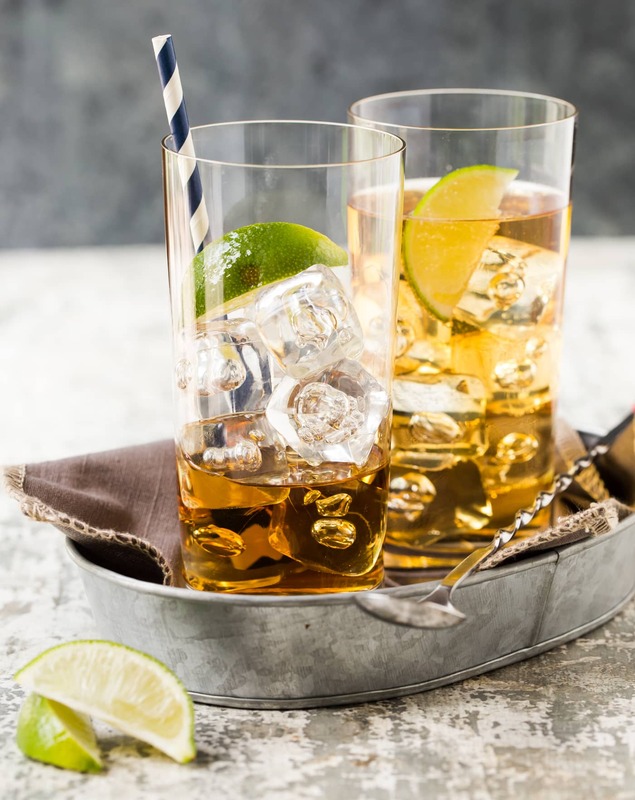 Place the whiskey, ginger ale and lime wedges on a table along with glasses and ice. Guests can add as much or as little whiskey to their cocktails as they like. Not a whiskey fan? Think again! This refreshing, 3-ingredient Ginger Whiskey Cocktail recipe might just make you one! Fill a highball glass with ice. Pour whiskey into glass. Top with ginger ale. Squeeze and float a lime wedge in the glass. The amount of whiskey can vary depending on your personal taste (and size of your glass). Pour in the amount that works for you! Oh I’m definitely in the whiskey loving camp! And ginger too! So I’ll raise a glass of this with you! Cheers! I could definitely kick back and relax with one of these ginger & whisky cocktails. They look and sound seriously delicious.. have to pin the photos! Such a gorgeous cocktail! Perfect for the weekend! This is known here in Milwaukee as a Milwaukee Mule (as opposed to a Moscow Mule, which uses vodka instead of whiskey), and it is fantastic! Good to know. Now I can sound like a local the next time I visit Milwaukee! Other than the lime wedge, I’ve always known this drink to be called a High Ball. Interesting, Carol. I’ve never heard that before. Cheers! Couldn’t you use ginger beer, which has a little more bite to it? Hi Aaron, as much as I love all things ginger, I’ve never tried this recipe with ginger beer. If you do, please report back how it plays out!